Chicago is getting a new mayor. The election is Feb. 26th. That’s right, in a stunning September 2018 announcement, Rahm Emanuel said he would not seek a third term as mayor of arguably the nation’s most corrupt and fiscally unsound city in one of the most corrupt states. Technically, he didn’t have to step down, as Chicago is the only top ten city in the union without term limits. Emanuel’s predecessor, Richard M. Daley, served 22 years as mayor and his father, Richard J. Daley, held the position for more than 20 years. “This has been the job of a lifetime,” Emanuel stated, “but it is not a job for a lifetime” citing personal reasons for the decision. Hmmm. Think he is a term limits proponent? The announcement came just after former Illinois Gov. Pat Quinn retained enough signatures to put a a referendum on the ballot on whether Chicago mayors should have a two-term limit on their time in office. In a desperate move to disqualify the more than 86,000 citizens who wanted term limits on the ballot, the crooked city council crowded out the Quinn’s question by slipping a “should Chicago ban plastic straws?” question. candidate with expertise over a seasoned politician with ties to existing leaders in the city of Chicago. What that says to us is that 69% of the voters want elected officials with real world experience and not career politicians whose only experience is political office. And it’s no wonder with all the omnipresent corruption the residents must endure. The very real problems Chicagoans indicated they face are economic pressures (>50%), political corruption (45%), and crime (87%). Cleaning up Chicago politics will help resolve the two latter issues and will go a long way to fixing the first! One of the top mayoral contenders, Bill Daley (yes son and brother of former mayors Daley), recently said he would push for a limit of two four-year terms on Chicago’s mayor as part of a proposed ethics package. 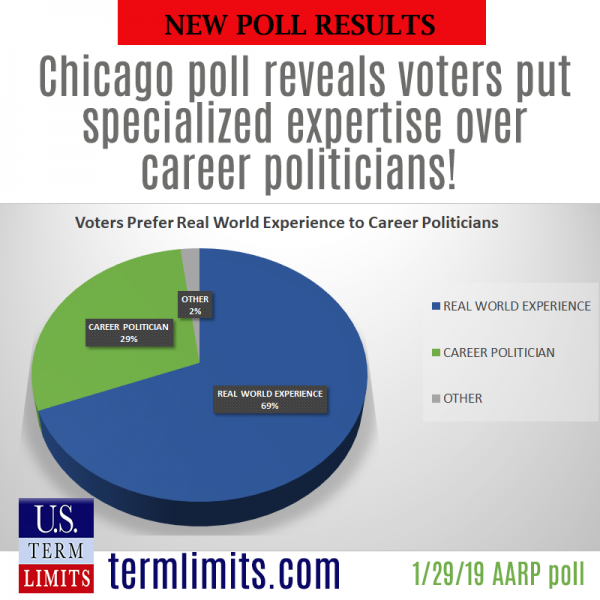 Recognizing the need to curb political corruption, nearly all of the Chicago mayoral candidates have indicated the need for term limits. According to Ballotpedia, in a January 10th forum, all candidates in the race at that time except for Preckwinkle, Joyce, and Sáles-Griffin, who were not in attendance, said they supported banning outside income for elected officials and instituting term limits for aldermen. The devolving quality of life in Chicago is not being resolved by career politicians – nearly half of the 50 aldermen have more than 8 years on the city council. The longest serving member, Ed Burke, holds the record at nearly 50 years. He is currently under FBI investigation for extortion. Read more about his escapades here: https://www.termlimits.com/chicago-term-limits-opponent-indicted-for-corruption/. All in all, more than 30 Chicago aldermen have been convicted of political corruption since 1973. Another, Willie Cochran, heads to trial in June to answer charges of wire fraud, bribery and extortion. Cochran was elected 12 years ago, defeating 17-year long incumbent alderman Arenda Troutman, who was subsequently indicted on federal bribery charges and sentenced to four years in prison. It’s no wonder. With a corruption track record such as this, that nearly all of the mayoral candidates are clamoring for term limits as part of their ethics programs. Importanly, term limits need to extend to the aldermen not just the mayor! But I’ll believe it when I see it. Last election, several candidates espoused term limits but got their funding threatened by special interests unless they removed the issue from their platforms. We’ll be keeping a close eye on this.